Stainless Steel Single Stage Pulper for pulping fruits & vegetables such as Mango, Tomato, Guava etc. The body of the machine is made out of S.S. rectangular pipes. 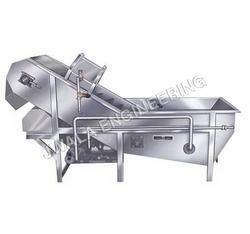 Special openable design of sieve is provided for easy cleaning and maintenance of the machine. The beater blades are made out of S. S.
All covers & hoppers are made out of S.S.
Fitted with Pressure gauge, air vent, temperature indicator, safety valve etc. The product to be concentrated is fed in the Vacuum Pan. The pan will be fitted with a slow speed stirrer. 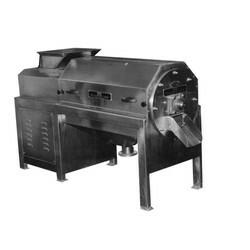 The stirrer consists of spring loaded Teflon scrappers ensuring that the scrapers are always in contact with the surface of the pan and hence eliminating chance of product charring. 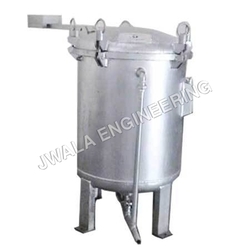 After concentration the product can be discharged from the bottom with the help of a pump. Water pump (2 nos.) for connecting the condenser and the cooling tower. 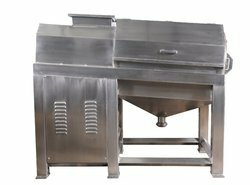 Fruit Washer is suitable for various fruits like mango, guava, apple and vegetables like tomato, carrot, cucumber, beetroot, peas etc. The product is dumped into the washer tank where an air blower attached to the unit will agitate it and subsequently washed by strong water spray. The product is pushed forward due to water pressure and it reaches the takeoff conveyor. On the takeoff conveyor another spray of fresh water will be provided. The takeoff conveyor will feed the product into the inspection conveyor. 9. 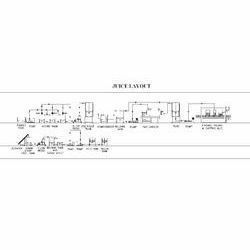 Suitable drive arrangement for the conveyor consisting of geared motor, drive and driven shafts etc. 10. Drain valve, overflow arrangement etc. 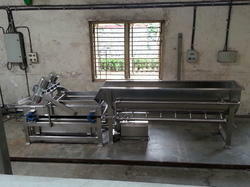 Our manufactured Vacuum Filling Machine is highly suitable for filling juice, ketchup, squash etc. 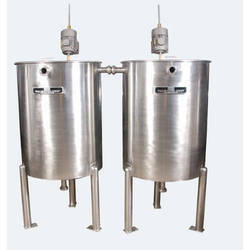 in glass bottles under vacuum and widely used in various food processing plants. The glass bottles are placed below the nozzles. Vacuum is ceated in the bottles due to the vacuum pump. The product fills inside the bottle upto the nozzle. This ensures uniform level of product in all the bottles filled. Rotary Pump Filler is another food processing machinery from our range, suitable for filling various products like fruit juices, juice concentrates, jams, fruit pulp, sauces, and other similar viscous and semi-viscous products. The machine has variable filling speeds with high filling accuracy, minimum spillage and high productivity. Containers of various shapes such as cylindrical, rectangular etc. can be used. Suitable filling heads and nozzles permit containers of 100 ml – 5,000 ml capacity to be filled. Quick changeover feature between products as well as containers. Rotary volumetric type filler, the machine has variable filling speeds with high filling accuracy. Containers placed on carriers, which in turn are placed on a conveyor chain. The containers are filled once they come below the filling head. Filling rate and volume can be adjusted by changing the pump and conveyor speed. 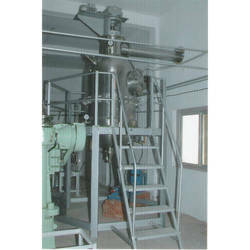 We are offering high capacity Pulper suitable for pulping fruits like mango, guava, tomato, papaya, amla etc. The Pulper is two in one type. It is fitted with one coarse sieve & one fine sieve mounted one below the other. The pulp from coarse sieve is transmitted to fine sieve automatically. The coarse pulper is fitted with blades/brushes depending upon the product while the fine pulper is fitted with brushes only. The complete body is made out of Stainless steel rectangular pipes. All the covers, feed hopper, discharge hopper, pulp collection hopper etc. are made out of SS 304. We are engaged in providing Hot Break System, used to chop the tomato and raise the temperature instantaneously to 90 deg. Celsius. Suitable for retaining the pectin in tomatoes to ensure higher viscosity and better quality of end product. The mangoes are fed in the machine where a few cuts are imparted on it with the help of rotating blades. The mangoes are then pressed against the sieve with brushes. The extracted pulp passes through the perforations in the sieve and stone and skin are pushed forward and discharged from the other end. Appropriate drive system consisting of motor, pulleys, V belts, bearings etc. 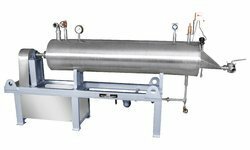 Suitable for pasteurizing the fruit/vegetable pulp and other viscous products by heating it at appropriate temperature for suitable time. The pulp is fed into the SS tube of pasteurizer from one end. The SS tube is heated with steam on the outside. There is a rotor in the SS tube with Teflon scrapers mounted on it. The scrapers ensure that the pulp does not stick to the surface of the tube to prevent charring and push the pulp forward to discharge it at the other end in the set time. Suitable for washing all kinds of fruits and vegetables. 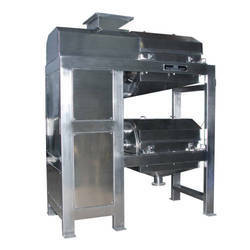 The unique feature of the machine is that it can be used to wash leafy vegetables as well, that normally have a tendency to float on water. Since the retention time during washing is more, we get better quality of washing and the machine can be used to wash dirty vegetables as well. The product to be washed is fed in the main washing tank. In the washing tank the vegetables are washed with the helical motion imparted in water. The product is then passed on to the vibratory unit fitted with perforated sheet. Due to vibration the product moves forward and is discharged to the next machine. The product will be subject to a fresh spray of water during their forward motion on the vibratory conveyor. Main washing tank fitted with nozzles, pipeline connection with pump along with valves, perforated tray for collecting waste, slope bottom, drain valve etc. Vibratory unit consisting of SS frame, SS body, perforated screen, structure for mounting the vibratory motors, springs etc. Arrangement for spray of fresh water in the system is provided including pipeline nozzles. Collection tank made with SS legs and SS body. The tank is made with slope bottom design. Our organization is topmost provider of Fruit Production Line to our clients.